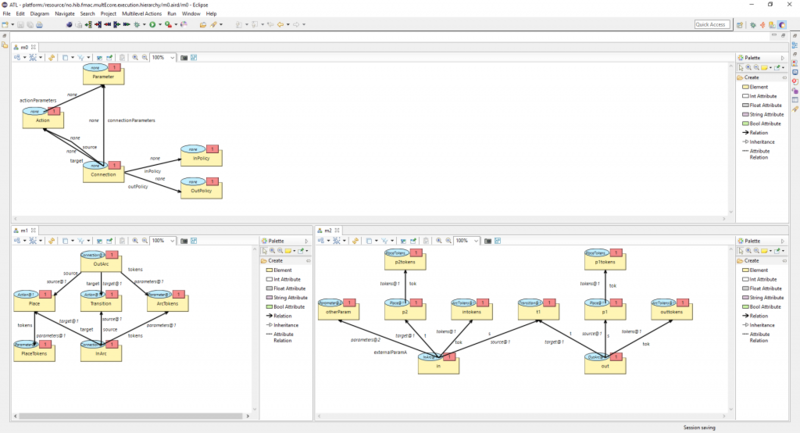 MultEcore is a metamodelling tool which brings together the best of the worlds of fixed-level and multilevel metamodelling approaches. MultEcore’s main plugin is a model editor based in EMF and Sirius, and combines the tool support, modelling ecosystem and low learning curve of EMF with the unlimited number of abstraction levels, potencies and flexible typing of multilevel metamodelling. A second tool allows for the specification of Multilevel Coupled Model Transformations that exploit the multilevel capabilities of the framework, and performs a proliferation process to generate two-level rules that can be used in traditional engines for model transformation. MultEcore is developed in the ICT Engineering Department of the Western Norway University of Applied Sciences. It has also been used in a joint work with University of Lübeck and a joint work with Universidad Autónoma de Madrid, which led to the creation of a tool for MLM rearchitecting and MLM tool exchange, available in Github. See the MultEcore tutorials, troubleshooting and FAQs. 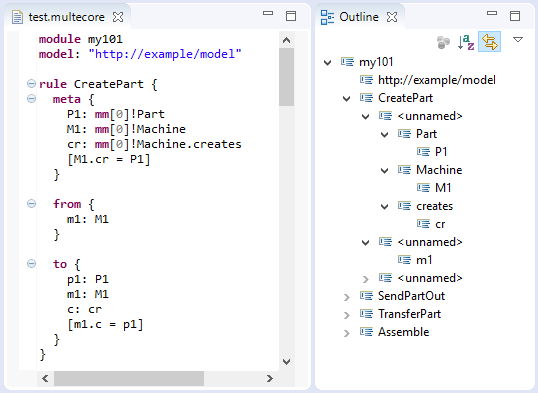 MultEcore basic plugins for Eclipse and the complementary MCMT-related plugins. PLS example hierarchy (zip) that can be imported into Eclipse (File→Import…→General→Archive File) and loaded with MultEcore. It contains a multilevel stack with five models and two branches representing an example scenario from the domain of Product Line Systems. Example MCMT rules (zip) for the PLS hierarchy that can be imported into Eclipse and edited with the MCMT editor. The example stack (zip) from the video demo. The source code and more examples are available here. MultEcore: Combining the Best of Fixed-Level and Multilevel Metamodelling [PDF] by Fernando Macias, Adrian Rutle and Volker Stolz. MULTI@MoDELS 2016. Multilevel Behavioural Metamodelling [slides] by Fernando Macias, Adrian Rutle and Volker Stolz. Integration of Runtime Verification into Metamodeling [slides] by Fernando Macias, Torben Scheffel, Malte Schmitz, Rui Wang, Martin Leucker, Adrian Rutle and Volker Stolz. Describing Behaviour Models through Reusable, Multilevel, Coupled Model Transformations [slides] by Adrian Rutle, Fernando Macias, Francisco Duran, Roberto Rodriguez Echeverria and Uwe Wolter. An Approach to Flexible Multilevel Modelling [PDF] by Fernando Macías, Adrian Rutle, Volker Stolz, Roberto Rodriguez-Echeverria and Uwe Wolter. Enterprise Modelling and Information Systems Architectures 13: 10:1-10:35 (2018). Here you can download the SVG files related to the commutative diagrams in the PhD thesis “Multilevel Modelling and Domain-Specific Languages”, where you can enable and disable layers to ease readability [ZIP].